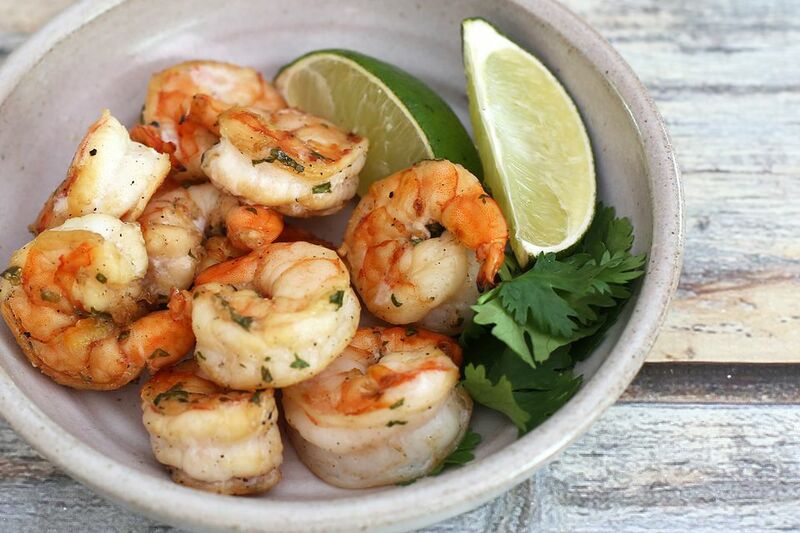 These easy grilled shrimp are flavored with marmalade and jalapeno chile peppers, along with fresh garlic, cilantro, and lime juice. Hot sauce (I used Texas Pete) and jalapeno peppers add the heat, while the sweet orange marmalade adds a touch of sweetness. Don't let the shrimp sit more than 1 hour in the marinade. Otherwise, the shrimp might become quite tough when cooked. The citrus and vinegar in the marinade will essentially "cook" the shrimp over a longer period of time. Mix lime juice, oil, and vinegar together in a saucepan and place the pan over medium heat. Add the sweet orange marmalade, hot sauce, salt, and black pepper; mix well. Add the minced Jalapeno peppers, cilantro, and garlic. Bring to a simmer. Remove from heat and cool completely. Peel the shrimp. Make a shallow cut down the back of each shrimp with a small, sharp knife. Pull the dark vein out or scrape it out with the tip of the knife. Repeat with the remaining shrimp and then rinse them under cold water. Arrange the shrimp in a deep glass dish or put them in a heavy duty food storage bag. Pour the marinade mixture over the shrimp, cover the container or seal the bag, and refrigerate them for about 30 minutes to 1 hour. Grill on a charcoal grill or gas grill until done, about 3 to 4 minutes on each side. Or broil the shrimp on a broiler pan about 4 inches from th heat for about 4 to 6 minutes.